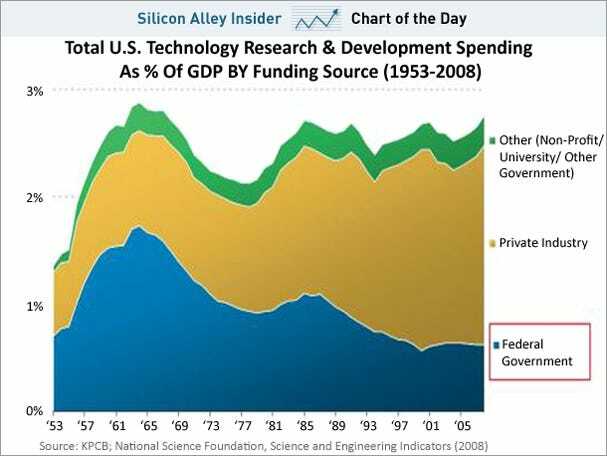 Total US tech R&D spending as a percentage of GDP is below where it was for much of the 1960s, according to Kleiner Perkins partner Mary Meeker’s analysis of USA Inc.
That’s mostly because government spending on tech research is way down. Right now, private investment is almost making up for it. That’s nice, but remember: private investment maybe have given us Facebook and Garmin, but public sector investment gave us the Internet and GPS. Meeker makes a strong case that more government investment in tech, education, and infrustracture, will be a key part of turning the USA around.